Wendy Dawson is a painter whose art practice is one of repetition and structure. 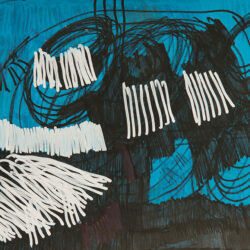 She produces her work by applying hundreds of linear marks to the paper using paint pens and permanent markers. Employing only two or three colours, Dawson gradually builds layers with these repeated parallel lines, creating an almost knitted quality on the paper and the illusion that the picture is somehow electrically charged. Wendy Dawson (born 1974) has been a regular studio artist at Arts Project Australia since 2008. She's been included in group exhibitions including Melbourne Art Fair, Royal Exhibition Building, Melbourne and has been featured in each Annual Gala at Arts Project Australia. Her work is held in private collections throughout Australia.